Important judgment on transparency in the family courts - The judgment being G (A Child: transparency in the family courts). 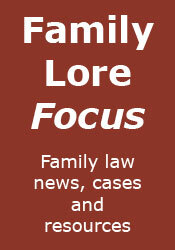 Can family law be used to make families more stable? - As some seem to believe. The damaging effect of parental alienation - Looking at the recent Cafcass Cymru review of research and case law on the subject.